Eukaryotic genes are normally transcribed as pre-mRNAs that must be processed before they are exported from the nucleus and translated into proteins. The pre-mRNA is cleaved and a poly(A) tail is added to its 3' end. 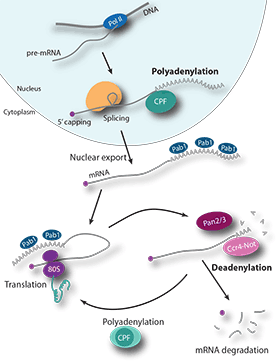 Several protein factors are required to coordinate the 3´ end-processing reactions, including a large multiprotein complex called Cleavage and Polyadenylation Factor (CPF). The poly(A) tail is required for export of the mRNA into the cytoplasm, to enhance mRNA stability and to stimulate translation. Its length can be regulated to influence these functions. For example, shortening of the poly(A) tail can decrease the efficiency of translation to control gene expression, and is the first step in mRNA turnover. The main deadenylase activity in yeast is found within the evolutionarily conserved Ccr4-Not and Pan2–Pan3 complexes. We are using a hybrid approach to understand the molecular mechanisms of these and other multi-protein complexes. 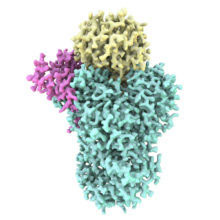 In particular, we use electron cryo-microscopy (cryo-EM), alongside X-ray crystallographic, biophysical, biochemical and genetic techniques. Cryo-EM is rapidly evolving and we are developing new methods to help determine protein structures. Overall, our aim is to establish fundamental principles underlying the assembly of multi-protein complexes, define their structures, gain insight into their activities and regulation, and identify roles for proteins of unknown function. Nat. Struct. Mol. Biol. 21: 175-179. Mol. Cell. 54: (5): 858-869.